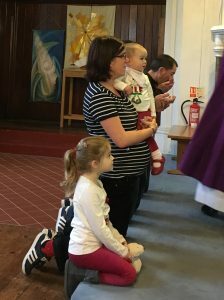 We are a family-friendly church and aim to support families to develop our young parishioner’s faith and spirituality. As well as providing special services aimed at families, we have a lively crèche and junior church for young children so that you can enjoy some spiritual refreshment at the main Sunday service knowing they are occupied and cared for. We aim to make learning about faith fun and interesting, so when it comes to communion and confirmation they will be invited to attend special age-appropriate classes to prepare. There are also several opportunities for other activities: Stay & Play, aimed at preschool children, Scouts and Guides organisations, junior choir and even a holiday club. To find out more about these activities see our get involved section. The church follows the Church of England policy for Safeguarding children and all of our workers and helpers with children have been DBS checked.